On April 7, 1873, Vermonters were blanketed with an early spring snow storm. That’s not particularly unusual in Vermont, unless, of course, the snow happens to be black. The snow crystals for this particular storm became contaminated with large amounts of airborne dirt. The dirt came from drought and dust bowl conditions across the Great Plains, a weather phenomenon that had gone on for 13 long years. It's snowing as I write this Spring newsletter and I'm reminded what a hard life many of our ancestors had here in Vermont. Life was a struggle against the elements and the way people accomplished the daily chores of living always fascinate me. Do you feel a story coming? My paternal grandfather was an embassy guard in Peking during the Boxer Rebellion. It was an adventure that included travel through San Francisco (earthquake) and Manila (wanted to cut down some of those Asian hardwoods). He returned to Vermont and worked as a sawyer and logging camp worker until he died from injuries sustained in a mill accident. My father was the eldest boy and left home to work on Bristol, VT area farms to support his Mom and four brothers and sisters. He tells of chopping wood one day and splitting his large toe, having it bandaged at lunch, and returning to work, only to inflict a similar injury to his other foot. He had the scars to prove it. My point, aside from evidencing my genetic proclivity to klutziness, is everyone has a story, and this summer we hope to host our first Elders Night to honor, share, and document what life was like for our most experienced citizens. We want to hear their (your) stories. We envision an informal panel discussion with a moderator and questions from the audience, followed by some social time. Sally Newton and Jo Anne Bennett will lead this effort. In the meantime the Board continues to need your help with the daily chores of the Society, and we could really use your help through contributions of items for our auction or volunteering to help with it. Please contact Sue Wilson, or any Board member if you can provide any assistance. It will make a great story! This year's Memorial Day commemoration will be at 10:00 a.m. on Monday, May 28th at the Clapp (old Village) cemetery. It will include readings, a short speech and military honors. Parma's donuts and cider will be served. Montgomery high school seniors interested in applying for our annual scholarship should contact their guidance counselors for an application and instructions or download them at our Scholarship link. Submission deadline is May 15th. 1. According to official records it has never been 70 degrees in February in Vermont. 2. Has any governor ever declared Vermont a "disaster area" because of a snowfall? 3. Of the following places, which is the wettest? The MHS Board set Friday, June 22nd as the date for this year's Annual Meeting. It will be at Pratt Hall, and include food and drink, the annual report, and a few surprises. Also a preview of our first fundraising auction (see below). Our first MHS auction will be held Saturday, June 23rd on the grounds of Pratt Hall. There will be a preview at 9:00 a.m., with the auction starting at 10:00 a.m. Sue Wilson will be our project Chairperson. We are looking for items of furniture and other household items in good condition, suitable for auction. Do you have an chair, end table, or object d'art you could part with? Need to make room for that new plasma large screen HDTV? Please give it some thought and let others know. Details on arranging pick up or drop off will be published in the next newsletter or call Sue. All donations are tax deductible. Anyone interested in helping out please give us a call or email. All concerts will be at Pratt Hall, and begin at 8:00 p.m. You can subscribe to the whole series, three tickets for just $25.00 members / $30.00 non-members, or purchase them as singles for $10.00 members/$12.00 non-members. Tickets are available a Lutz's Automotive in advance or at the door. We plan to hold our annual show, along with the Covered Bridges Garden Club's Harvestfest, on Saturday, August 25th. Our member’s appreciation fete will be the night before. Stand by for details. The Board submitted an application for a grant to the TD Banknorth Charitable Grant committee in March. We would hope to use the money to reduce our debt and begin preliminary plans for a storage and exhibit facility. We may know how we fared later this month...keep your fingers crossed. We regret we will not be participating in this year's Expo (we normally go every other year.) We will shoot for 2009 unless something develops for 2008. Please let someone know if you have any suggestions or would like to organize, or work on, our effort. Thanks. Dee Pratt wishes to invite Society members to join her family for a memorial service for her late husband, Jim, Saturday, July 21st at Pratt Hall, late afternoon (time to be announced later). Jim was an avid booster of the Society and Montgomery. Share your memories and help us pay tribute. We are proud to offer you the recently released DVD “Life In Franklin County”. Produced by Johnson State College students, this 40 minute program includes pictures and interviews of people that lived many of the events. This wonderful program includes our own Bill Branthoover talking about making mischief as a child visiting his grandparents in Montgomery. This is a “must see” for anyone interested in what life was like in our area. Please contact any Board member or send us an email request. The cost is $12.00 for members and is tax deductible. "The forest is rapidly closing in on what was once Black Falls as I remember it. Many stories could be written about these mill hamlets, where pioneers went back into the virgin forest, erected sawmills and did a thriving business for several years. 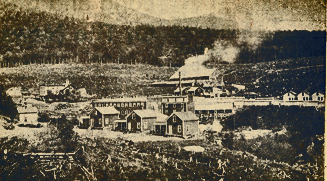 In the gay nineties Montgomery had four tub mills and about twelve saw and wood-working mills, besides two grist mills. Now the wheels of industry have ceased to turn, I fear, forever." From “The Vermont Quiz Book” First Edition, 1986, Bryan and Bryan, original source David Ludlum's “The Vermont Weather Book"
We kicked off the 2007 membership drive in mid March, mailing out about 500 letters. It takes four of us over 3 hours just to fold, collate, stuff, stamp, and sort them. Thanks to TD Banknorth for printing. To date we have 97members, including 7 new members. Thanks to all of you for your membership and other contributions. I also want to acknowledge what a wonderful job Marijke Dollois does with membership every year. This is a time consuming, labor of love and we are all very lucky to have her on our team. Additionally her many years of service to our organization as President, Secretary, data base maintainer, label printer, and utility infielder deserve our deep appreciation. Thank you Marijke! Over the past several months we've been forwarding e-mails from the Vermont Historical Society's outreach coordinator with events happening at local Societies, as well as other information we think may be of interest. Please let us know if, as Martha would say, these are "a good thing." If you haven't already and would like to receive this newsletter and other event reminders or news via e-mail, please send us an e-mail - pratthall@gmail.com. Thanks. Please remember to mail your membership!